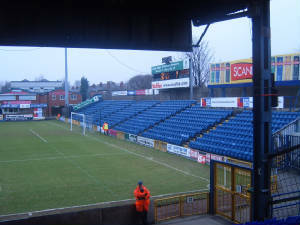 I've been to the general Manchester area plenty of times in my life to watch football matches, however, I had never been to Edgeley Park and I was always keen to visit it, if possible. So the time came around when Lincoln were due to play there and the trip to Stockport became inevitable. After the usual trip through the Yorkshire valleys, we finally arrived at Stockport and the first thing I noticed was, that it's full of chavs, absolutly full of them. Anyway, as usual, the first thing in the ground that we visited, was the ever fun club shop and there are very few in the country that will be as small as Stockport's. After less than 5 seconds, I decided to leave and head to the turnstiles. Getting through the rather unusual turnstile system, I noticed that we shared them with home fans and I thought to myself that in a local derby, this could be quite dangerous. After getting to the away end of the stand, it became a struggle to find a decent seat in which you could clearly see what's going on at both ends because there were a lot of pillars and also the camera planks in the middle. Other than that, the view is quite good from the away end. 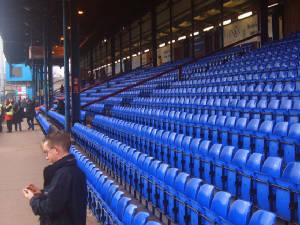 The stand behind the near goal is a fairly large seated end, however this is only open for away fans if more than 850 away fans make the trip. The stand opposite the usual section for away fans is an odd stand. It's fairly tall but doesn't go all the way along the pitch, however, this must have a good view of the action. The final stand reminds me of Nottingham Forest's Trent End or the Kop Stand at Tranmere, it is huge and is divided into 2 tiers. 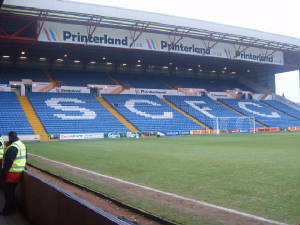 The atmosphere at Stockport is fairly good, they have a great away atmosphere and this was replicated at Edgeley Park and having 1000+ people singing at once in that stand behind the goal is something special. 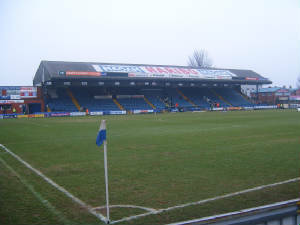 I would definatly recommend Edgeley Park to a person looking to go to a random game, it is a great day out, thoroughly enjoyable and best of all, this is the sort of ground football should be played in.